International Conference on “Schools Responsiveness to Quality education of Children with special needs” December 22, 2017. First Published on IASmind. Download In PDF, International Conference on “Schools Responsiveness to Quality education of Children with special needs” December 22, 2017. Prabhu is an eight year old boy who goes to the neighbourhood school with his elder sister Meena, everyday in the morning his sister puts on the radio for waking him up. After getting up he asks her, “do we have school today”? Meena assures him, “yes there is a school today” and prabhu and meena leave for school walking and prabhu runs ahead because he knows the way and its Quite proud of it. After reaching school, both of them go to their respective Classes.” In his class prabhu hangs out with his classmates. In the beginning Prabhu had no friend. Making friends and learning appropriate Social interactions had been a struggle. He would just hug his peers who would Keep discouraging him from doing so. 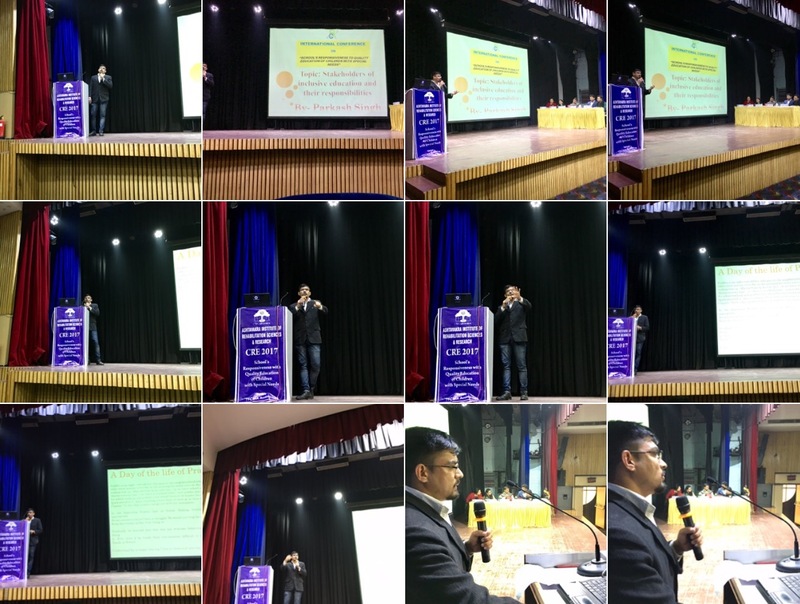 Parkash Singh gave First paper presentation in International Conference on “School’s Responsiveness to quality education of children with special needs”. On Dec 21, 2017 at Tecnia Auditorium, Rohini, New Delhi. Download in PPT, Presentation Slide. Gradually he learned that this was not welcome behaviour and he stopped doing it. Now, even if he funds their conversation difficult to 42/Meeting Special Needs in School. Understand he is happy staying Close to them and playing whenever Possible. In his language class his goals are modified. While others can read stories he listens to them and looks at the pictures. Gradually he has started reading a few words with the help of his friends and would some times tell the same story to his nephew who is just three years old. This makes him feels very proud and grown up. There are other activities in the language class which are quite a lot of fun. The teachers gives commands like “put your hands on top of your head”, “Put your finger on your knees”. It is fun to do all this in class and learn concepts like “top”, “over”, “Bottom”, “Under” etc. After a while when other children are doing some written assignments his teachers calls Prabhu and tries to teach him money concepts. Prabhu recognises different coins and how many of them makes a rupee. Maths is a difficult subject for Prabhu but his teacher Malini does not hear the word “I Can’t” She has high expectations from all her students and believes that there is a no failure but only learning. This encourages all students and Prabhu also counts the coin with little help from his peers. After returning from school Prabhu plays cricket with children from his neighbourhood and enjoys this game. He loves to throw ball and feels happy when he gets success in this game and all the other children praise him. Attitude or commitment of appreciating diversities. 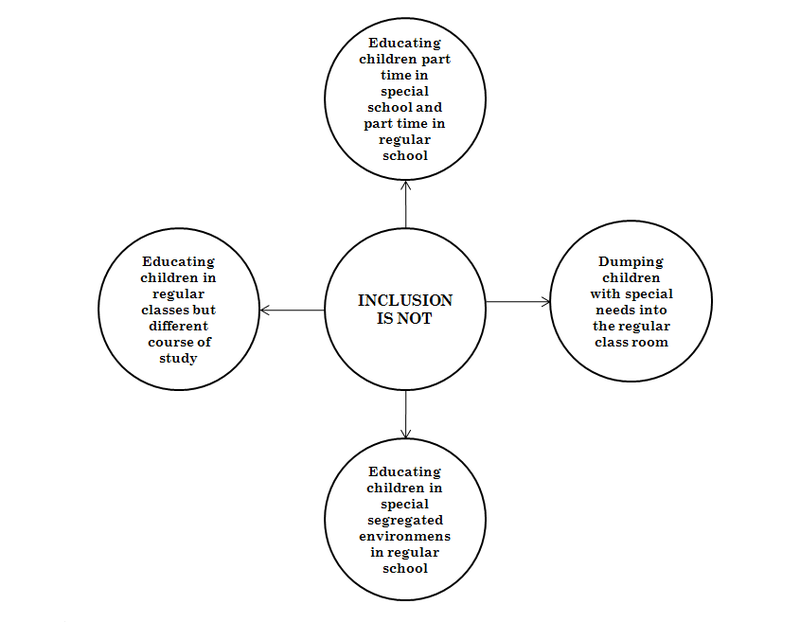 According to national commission of special needs in education and training (NCSNET), Inclusive education is define as a learning environment that promotes the full personal, academic and professional development of all learners irrespective of race, class, gender, disability, religion, sexual preference, learning styles and language. According to disability, awareness in action (2003) when we refer to ‘inclusion’ we mean the participation of disabled children through the provision of fully accessible information, environments and supports. This can include the provision of barrier free environments, information in alternate media such as braille or on tape, acknowledgement of sign as a language and the provision of personal assistance support and interpretation. According to UNESCO 2004 views inclusion as ‘a process of addressing and responding to the diversities of needs of all learners through increasing participation in learning, culture and communities, and reducing exclusion within and from education’. In Short, It happens when students, peoples or such children with and without disabilities participate and learn together in the general or same classes. Number of Research and studies suggest that, when a student with disabilities attends classes alongside peers who do not have disabilities, good things happen. Further, We need to keep in mind the term ‘Exclusion’ while dealing with ‘Inclusion’ or ‘Inclusive Education’ In India because such type of students are excluded, Society and Institutions at Large. Said, Mr. Trilok Singh, Owner/CEO of IASmind and the Youth Darpan. Communicating with the child with special needs. Community should take steps to make an unity in the surrounding..
Be informed and involved in education decisions that effect their children.. Peer should create a grater opportunities for integration.. Supporting the school responsibilities for education of all students. Trilok Singh told us during the conference that, Scientific Selection of teachers on the basis of him/her capability, efficiency, aptitude and Knowledge are very much significant with the same regard. In other words, taylor scientific management suggest that, brainwashing of people called ‘mental revolutions’ are required to cycle the same issue, Society and Institutions at large. Further he said that, we need to build a think-tank network for exploring the same idea and not only the teachers while its a collective responsibility for all to get rid about the same. Also, Our National Level NGO Called VSSKK, India are one of them those who always promotes such kind of Idea. Significantly, Teachers should be well trained and Well prepared with the same environment/light, teachers should have good ethics, morality and honesty and the teachers should deals with students just as a friend, Sure it helps or motivate him/her. We need to think beyond to makes our exercise more efficient. To be sure, there are multiple issues will need to be addressed if the Universities, Schools, civil society, Institutions and NGOs intends to move in above direction. The suggestions, feedback and ideas of different stakeholders will have to be debated in order to build Societal and political consensus around the same idea. In order to this, Morality, accountability and responsibility are becomes to much significant. Also, Number of Government schemes were successfully done by the appropriate ministries for such kind of students the people, Society and Institutions at large. E-learning, Sound Systems in various places, Digital technology for special needs students across the institutions etc and this one makes responsive class for him/her. The ruling party much focus towards E-College/University, E-learning approach, Various Forums like civil society and and we need to do more about the same. We need to keep in mind the term ‘Exclusion’ while dealing with ‘Inclusion’ or Inclusive Education In India because such type of students are excluded, Society and Institutions at Large. Importantly, The Constitution of India also provides many rights to motivate or protect such kind of students. i.e., The Person with Disabilities Act, 1995, The Mental Health Act, 1987, The Rehabilitation Council of India, 1992, The National Trust for Welfare of Persons with Autism, Cerebral Palsy, Mental Retardation, and Multiple Disabilities Act, 1999, Declaration On The Rights Of Mentally Retarded Persons etc.. In Short, The Constitution of India applies uniformly to every legal citizen of India, whether they are healthy or disabled in any way (physically or mentally). Further, The right to education is available to all citizens including the disabled. Article 29(2) of the Constitution of India provides that no citizen shall be denied admission into any educational institution maintained by the State or receiving aid out of State funds on the ground of religion, race, caste or language etc.. Copyright, Parkash Singh and the Youth Darpan. Author/Writer, Parkash Singh is living in New Delhi, India. Singh is a part of YD authors community since Dec 10, 2017 and has published first International Conference Text on Youth Darpan.